The Life of Bon: Should kids see their parents fighting? How about fights? (I guess I like to talk about fighting in marriage!) Is it okay to argue/discuss/disagree in front of children? In my home when my parents were having a disagreement they went into another room, or else sent us kids downstairs. I'll be the first to admit that I sat on the stairs and listened to their arguments. I wanted to know how it worked. Why was dad frustrated? Why was mom crying? What was going on here and why couldn't I listen to it? I felt almost guilty for these disagreements. Like we weren't a perfect enough couple or in love enough because there were suddenly so many things we needed to work through. I've mentioned before that early on in our marriage I thought every fight meant we were getting divorced. I honestly started to wonder if we weren't going to make it because we had fights. I didn't realize that this is normal. No other couples talked about their arguments. My newly married friends never admitted to me that they argued (Of course not, every relationship is perfect!) And I didn't see my parents work through their disagreements. In fact, the only thing that helped me was knowing that my brother and his wife had also had a hard time adjusting to marriage. That was the sole thing that let me know that maybe Greg and I weren't freaks, maybe we weren't mismatched, maybe it was just a natural getting married and moving in together and learning how to make all your decisions together stage. I wonder if I had watched my parents/ siblings/ friends/ neighbors work through disagreements if I would have been more comfortable in my own marriage those first months. If I would have had more confidence and security knowing that surely every couple has to figure out how to work through problems together? Maybe I'm way off base here, but I'd love your opinion on the matter. 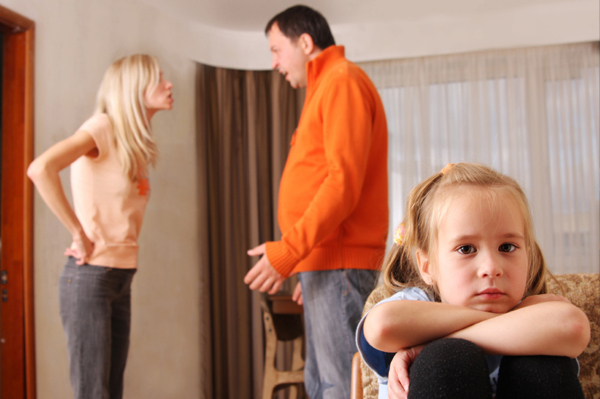 Do you have arguments in front of your kids or do you take them to another room? Did your parents argue in front of you? And please, someone, can't you just give us all the right answers already? Yes, you can have a disagreement in front of your kids! As you allude to, it teaches them how to deal with conflict in relationships. Here's the challenge--oftentimes those disagreements are related to the kids and then I don't think having them present is a good idea. So I guess my answer is both. Some things can be discussed with children present and some things are best left until later! P.S. My oldest kiddo (of the four kids) is only 5--we are too tired to argue, LOL! Of course you can disagree in front of your kids. And as long as you disagree with respect to one another, doing it in front of your kids shouldn't be harmful to them. I think there is value in learning to compromise, learning to speak your mind, even when it might not the the *popular* opinion in your own house. What isn't healthy is the environment I grew up in, screaming fights between parents and a house in constant upheaval. This really shaped my adult life and who I married. I live in a very *quiet* house. My husband and I rarely disagree and when we did, my children (who are in college now), rarely saw it. Love this. My parents always argued behind closed doors. I think having HEALTHY conflicting conversations in front of your children is ok, they need to learn how to address conflict in a productive way. I think you can safely have arguments in front of children, as long as they remain respectful and don't turn into insult slinging. I think it's equally as important for the kids to see the resolution though too. It shows them that disagreeing is healthy and a part of a relationship. I don't think it's appropriate to fight with your husband in front of your kids. It definitely can affect them negatively and it is uncomfortable for children to be around their parents during arguments like that. Even when they're babies, arguing in front of them can still really affect them. I think if it is going to be a serious and long argument/talk, then it should be done in private. Or if it is about how one of you is parenting, then it should also be done in private. You never want to look like you are undermining one another. But in general I think it is OK to argue/disagree in front of the kids (or as a friend calls it "having intense fellowship.") The important aspect is to let them see you say you are sorry or whoever is in the wrong admit they are wrong. It shows them how to deal with conflict in a healthy and productive way. They learn by watching us. And if we, as parents, don't show them how to handle arguments, then they will never know. I think if it's a discussion that doesn't involve the kids and remains calm, yes- it's OK to have disagreements in front of kids. However, as soon as tempers flare or if the topic is related to parenting or kids' behavior, then no- I don't think it's OK.
We try not to argue in front of my son. I have memories of my parents screaming and cussing at each other. It made me feel unsafe and that somehow if I was just "better", I could make their lives easier and they wouldn't argue so much. I took it on my shoulders to "fix" their marriage (they divorced when I was a teenager). I also remember them talking about me as if I wasn't there. It's not a good feeling! However I completely agree that children need to learn how to work out conflicts in a healthy way. But I think there are a lot of factors to consider as well. I think when my son is older, we'll start demonstrating/talking about ways to resolve conflicts in marriage but not anytime soon and most likely not until he is in his late teens and shows maturity to handle a relationship. I totally have this internal discussion with myself too! Can I take a second and admit that raising a child scares the living daylights out of me? Geesh. I think that there is a fine balance to be struck. Children need to see HEALTHY fighting. They need to see that their parents can fight, yet not get divorced. They need to see how a couple can resolve problems without yelling, screaming, name calling, or physical abuse. Not fighting gives your children an unrealistic expectation of marriage, and relationships in general. They will often learn their fighting habits from us. My parents used to get so upset that I would raise my voice at them when we had heated discussions. But I learned it from them. They often raised their voice first. And I would always point that out. I'm not afraid to admit that sometimes my husband and I don't fight fair. We raise our voices and yell to be heard. That's what I want to keep away from my children. Ayeee this is something I haven't thought of and now I am really thinking about this! My parents had discussions in front of me and I remember hearing them compromise. I don't remember if this was while eavesdropping or if it was in front of us. I definitely agree thst they need to see healthy fights, not crazy cussing fights. On the fighting note when you first got married - I thought the same thing when I first moved in with my fiance. Luckily, I had a friend to turn to and ask and she would frequently talk me through how normal it was. I definitely was in the same boat as you. I never saw my parents argue. And with every "heated" discussion my husband and I had I would classify it as a fight. I would say we fight all the time. He says we've only fought 3 or 4 times. He watched his parents fight all the time. In response, he embraces conflict and I definitely internalize EVERYTHING. I think the important thing would be the nature of the arguments and how they are resolved. If it's constant fighting, or if one person is constantly picking at the other person unfairly, I think that can be bad for a child's development. I don't remember my parent's really fighting that much at all, and sometimes I think that may not have been the best because I also have a tendency to really internalize my feelings (I also have this irrational logic that Matt should always just KNOW why I'm upset--shouldn't all men be psychic about women's feelings?). I think as children are a bit older it's okay to have (and resolve) disagreements in front of them, because I really think that would be good for their emotional development. However, when kids are really little they aren't as developed, and a heated argument would probably just scare them instead of having any real benefit. My parents always did a mix of it. Sometimes my mom would get angry and go to another room to cool down, and my dad would follow her to talk to her about it. Other times, one of them would just blow up about some small thing right in front of us. I was always scared when my parents argued because I had so many friends with parents getting divorced saying that it was because "they always argued". However, I think seeing my parents argue has been an eye opener to me because now when my husband & I argue, I can see where I'm being silly (because I do the same thing as my parents- and it's easy to see where they're being silly as an outsider) and calm myself down, and we can talk about the problem rationally & without a lot of screaming. I've always wanted to "hide" the fact that Jeff & I argue from our kids because I don't want them to get upset like I got upset, but I also think it could be healthy. I'd say with huge arguments, maybe keep it from the kids? They don't need any doubt put in their mind that their parents love each other, and sometimes watching people argue can do that. But I think with little fights, it makes sense. It's not normal for people to NOT fight or argue every once in a while. I think it's unhealthy if you don't disagree on some things. So yeah, maybe have arguments in front of your kids so they don't have unrealistic expectations when they get married, but save the big, yelling, tear- causing arguments for the bedroom or garage. Kids don't need that in their life. This is a really interesting point, and I have no idea how I will handle it when I have kids. My parents never really fought in front of me, but they would have little arguments are disagreements. My mom is extremely emotional and sometimes her feelings are hurt easy. Whenever she would get upset, I would watch my dad take a deep breath and hug and comfort her. They would then talk about what they needed from each other and the problem would be resolved. I think it was good for me to see this because it taught me that I needed to have patience and understanding in any relationship that I am in. I don't remember their fights, but I always remember them making up. I think there is a fine line between disagreement and fighting. I believe that as long as the conversation is calm, respectful, and quiet a disagreement can take place in front of the children. At that point it's mainly a difference of opinion and they need to learn how to handle that. I would like to add that this is only ok if it has nothing to do with the kids or parenting in general. I don't remember my parents arguing ever. I know they had struggles, but I never felt like I was given unrealistic expectations about marriage because I didn't know their every argument.. I have been married 5 years and have had 3 or 4 fights with Mr B total... we have disagreements, sure, but we try hard to keep them respectful and calm in front of the little ones. I also believe handling conflict is something you can teach in a way without demonstrating it in the middle of the kitchen with the kids watching on.. I think that it is fine to argue in front of your children as long as they see you make up as well. If all they ever see is you do is fight and they are never there to see you make up it could send a bad message. I never say my parents make up after an argument so when I got married I had no idea what to do. When I would get mad at my husband I just expected us to get over without much effort. I was wrong. I don't know why marriage seems so much easier until you actually get married. Oh this is a hard one. My parents never argued in front of us but I always knew when they were angry with each other. The whole atmosphere changed in the house. I think it would be difficult not to fight around your children because when you are angry it's hard to put it on the back burner when you are in the moment. Hopefully we will be able to learn to fight respectfully when issues arise. Right now we just have disagreements about silly things like what temperature to put the thermostat on or whose turn it is to do a chore. I know bigger things will come up but hopefully we will be able to handle those deals away from our child. I have three kids (yes, I'm surprised I'm still sane too) so arguing and fighting without them around is nearly impossible. My other half and I have been together for over eight years (OMG) and adjusting to each others habits and trying to live up to these huge expectations of how the other person is supposed to be/act/etc. is HARD. We constantly get frustrated at each other and we do argue and yell from time to time in front of our kids. I think seeing us argue and fight then get over it the next day helps them understand how to handle those kinds of situations. My parents would argue and fight in front of my siblings and I, so when Joey and I started living together I learned to have a lot more patience. You just gotta teach your kids that it's okay to get mad and argue as long as you're able to settle things afterwards. Don't go to sleep mad or drag out a situation. The WORST thing you can do is hold a grudge against your significant other - you'll only be destined for failure. At the end of the day, always have a talk with your other half to let them know that you still love them, no matter how mad you both get at each other. Even if they're giving you the silent treatment, it'll still help if you just say "I love you". I don't have kids but I have 6, almost 7, nieces and each one of them have seen their parents fight, and two of them are products of divorce. Sure its hard on them but they see how Mom is overcoming everything and makes everything good for them. They certainly will learn from it! My parents didn't argue in front of us. So that means on the rare occasion they did I'd cry and think they were getting a divorce. I think it's all a balance. Arguments are probably okay, fights are not. All i know is that Harlow hates when Chris and I argue. He puts his tail between his legs and tries to sit on my lap even if I'm standing. I hope kids don't do the same thing. My parents disagree in front of their children. Often. They bicker sometimes and on a very rare occasion do they argue. I don't think an argument is the only way to resolve a conflict. While I am sure they argue behind closed doors, I think it was healthy for me to see them have disagreements without contention. I have never once in my life seen or heard my parents yell at each other. My dad told me that the only times they full-on yelled at each other was during the first three or five years of their marriage, which I think is pretty cool. One thing that my parents do that I am not fond of is discuss a particular child amongst other children. The three children present are of course listening carefully to the downfalls their sibling has and then will use those downfalls against them later on. Maybe i hold different connotations to the words "fighting" and "arguing" but my husband and I NEVER fight or argue. We don't always agree and we talk things out and try to understand each other but this is only because in my first marriage I was married to an extremely verbally and emotionally abusive guy who I finally left because of his abuse towards me and also because I didn't want to raise children with a man who yelled and belittled when he was angry instead of discussing things and trying to understand. When I was married, my ex and I never fought in front of the kids. When we told them we were divorcing, they were shocked, besides the shock of divorce in general, they didn't understand because they didn't realize we were unhappy. I don't know if arguing in front of them would've eased the shock. I guess this is a ramble, I don't have an answer, truthfully. But, I don't know if I would do it differently now. I never saw my parents fight or argue when I was growing up so it came as quite a shock when they got divorced. It took me a couple of years in my marriage to not think every fight was going to end in a divorce. I think it is healthy for kids to see that patents can argue and make up. Arguing doesnt have to mean divorce. I think its very important for kids to see their parents disagree and argue. It teaches them how to deal with conflict in a health manor and it assure them that mom and dad disagree but they still love and respect each other. Now i dont think its appropriate to argue about the kids in front of the kids because kids have a funny way of making everything their fault. They also learn manipulation quickly so its best not make either parent the good/bad one as kids will use that info in their favor. Yell and screaming and name calling should never be done, especially in front of your kids, but a health argument and or disagreement? go for it! Well we had the same sentiments on our early marriage days! Crazy expectations, etc. My family also never fights in front of anyone, so I thought they never did. I think showing that you can work through a problem in a healthy way is a good resource, rather than pretending like we're all perfect and really hashing it out in the closet. Being imperfect sinners means we're going to have problems, and shouldn't we show our kids that's ok and can be worked out? My parents never really argued in front of us growing up, or nothing I can significantly remember. So it came as that much more of a shock when the D word surfaced. For years I said I didn't believe in love and resented to the 4th power how quickly it seemed to turn from them, yet we had no idea. We don't have kids yet but I would feel perfectly comfortable having arguments/disagreements in front of them. I actually think it's healthy for kids to see that being in a successful relationship means you have to work at communicating with each other and adjusting to each other's wants and needs. Sometimes that happens in the form of arguments. When two independent people come together and decide to share their lives with one another, it's only reasonable to expect that some disagreements will come up from time to time. They way you work through them - including being respectful of your partner and arguing in a productive way to solve the issue rather than tearing each other down - can be a huge, invaluable lesson to kids, I think. Of course, it depends on the type of fighting. If the couple just cuts each other down with every argument rather than truly trying to work it out, or there's violence involved, that seems like something that would do more harm than good for kids. But arguing/disagreeing in a respectful, healthy way can be a good thing for all the reasons you mentioned and more. I think there is a major difference in battling it out infront of your kids. Especially if it gets nasty and things are said you don't mean to say, and working out your issues and showing your kids how to work through problems. I think a big issue in marriage today is that no one wants to work through the crap. They just throw in the towel and get divorced. Where if they were shown it's ok to fight and work it out because you love each other and it's ok to have a different opinion. I think there is a difference between a fight and a discussion. I agree with a lot of these comments, if the disagreement is about the kids or how to raise them or what to let them do, come to a consensus together and then approach the kid as a united front. If it's a tiff about where you're going to go to dinner, or what you're going to do on your vacation or money or whatever it may be, so long as you both keep your cool and it's a discussion rather than a screaming match then I don't think you need to sequester yourselves. Children get to an age where they can leave the room on their own if they're uncomfortable. Really interesting post to read! I think my main spiel is that it's up to the parent whether or not they are willing to let their children watch/listen to them fight, but I think no matter what, the kid should stay well out of it. Burdening the child even in a small way (tell your mother/father blahblahblah) or even speaking negatively about your spouse to your child is really, really damaging, no matter how insignificant it seems at the time. No, it's not ok to have arguments in front of the kids. Kids deserve to be in a safe, warm, protective environment. Fighting in front of them, like one of your commenters pointed out from personal experience, makes them feel insecure, unhappy, and perhaps even that it's their fault. Children aren't mature enough to discern what is a "healthy disagreement" and what appears to be just two people who are angry with each other. They don't have that maturity or objectivity to discern. I don't know about teenagers, but I would guess the same rule should apply. Parents should do their best to put up a united front, say kind things to each other, show love, respect, tolerance, and set an example of what a healthy marriage is. That's not to say that you can't disagree with each other, but like others said, should be dealt with in as civilized a manner as possible. Kids have enough crap to deal with in life… home should be a haven. Now if only I could practice what I preach! It's definitely a daily endeavor. Great discussion topic Bonnie! BTW, that was Mindy, not Ben. Nothing wrong with children seeing their parents bicker and have a disagreement followed by them seeing mum and dad being all friendly and loving again afterwards. However, I do not think parents should have screaming matches and all out fights in front of children, Tim and I have never had a fight like that in front of our children and to be honest have only had a couple of fights like that in our 30yrs together. I think it's fine to have small disagreements in front of your children as long as it's in a calm manner and the two of you are able to come to an agreement and show your kids that you are still happy and love each other... I think that might teach your kids how compromise works. What I think is wrong is parents who go all out screaming at the top of their lungs at each other, all day, every day, throw things, slam doors, say things like "I hate you", etc... I feel that kids who grow up in homes like that grow to think that's a normal relationship and in future relationships will demonstrate those qualities. I actually remember Mom and Dad arguing in front of us. Maybe they got wiser as they got older, but I actually think it was a healthy thing. Because I learned that it's normal to disagree, but that doesn't the marriage is through. I absolutely 100% agree with you on this one. I only saw my parents have an argument one time as a child. When my husband and I got married, I had no idea how to have a healthy argument, and that doing so was perfectly normal. It still makes me panic a little and fear divorce when we do argue, and I think it directly relates back to this. I think showing your kids how to resolve conflict in a healthy manner is one of the best gifts you can give them! Our rule is that if we have an argument/disagreement in front of the kids, we have to resolve it in front of them too. I think that if kids never see conflict they will have unrealistic expectations for relationships, but if they can see conflict handled in a loving and open way then they can learn to resolve relationship issues of their own in the future. I'm going to preface this with the fact that I don't have kids (yet), but I was just thinking about this kind of thing this morning. My husband and I are both kids from divorced families, and he unfortunately did witness his parents fighting a lot before they split up. If mine argued, I don't remember it because I was four when they separated. Regardless, neither of us have a model for what it looks like for two people to parent together, so I think it will be really interesting to see how we learn to do that when we start a family. I really liked what Susan said above about resolving conflicts in front of your kids if you argue in front of them. Conflict resolution is so important! I grew up with parents who didn't have disagreement s in front of me. I have to say that was a blessing and showed me what respect was. As my parents had 7 children there had to be order in the house. We never had a lot but we could count on the stability of our parents relationship and how they respected eachother. They were always on the same page. Even 36 years of marriage later. Now my job as a nanny has seriously shown me parents fighting and arguing in front of their 3 year old. It just seemed awful that the parents can't be on the same page if front of their kids, I think it confuses the child. They can't be consistent when they argue and the 3 year old can't decide which way the argument can go. And key with children at a young age is to start by being consistent with everything including disagreements on all matters. Of course there will be slip ups but we can teach are kids about dealing with conflict , doesn't mean we have to involve then in our own.